Seasonal guide of what wildlife fauna and flora you are likely to see on a trip with Dolphinwatch. Our boat trip season is April through October. During this period, we are privileged to witness the natural progression of breeding, rearing young and the seasonal changes to the food source. Although we have given a “month by month” guide to some of the natural highlights in this diverse habitat area, there is overlap of course, and this is a general overview. We hope that it will help you to appreciate the diverse and fascinating fauna and flora found at the Mouth of Ireland’s Greatest River: the Shannon. In April, we are seeing Spring in full swing. The weather is warming up, the cliff tops are looking greener as the ferns and grasses rebound after the winter. Early wildflowers start appearing on the cliffs. If you are walking in the countryside, you hear the return of the Cuckoo, recognised by its distinctive “cuckoo” sound, which is the male calling. Sprats are a “keystone species” and the most plentiful oil rich fish that dolphins and other marine wildlife crave. The dolphins can appear thin as pickings have been slim and they are waiting now for the mackerel and salmon to re-appear. They are mainly eating sprats and sand eels now. Black guillemots with their red legs and beaks and white wing patches frequent the area between Carrigaholt Pier and Kilcredaun Point, throughout the Summer months. The dolphin groups can be further west during this month, so trips tend to be a bit longer. With only one trip a day, we can take our time, enjoying the stunning “cliff-scapes” of Loop Head. 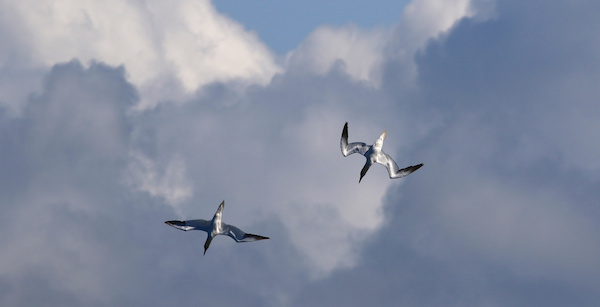 The ocean going gannets and shearwaters begin to appear. Throughout the Summer, Storm Petrels are driven close to land by offshore storms. The salmon run begins as the fish come into the Mouth of the Shannon in search of the rivers in which they will spawn. It is a thrilling spectacle to watch as dolphins pursue them. The dolphins are beginning to calve now. 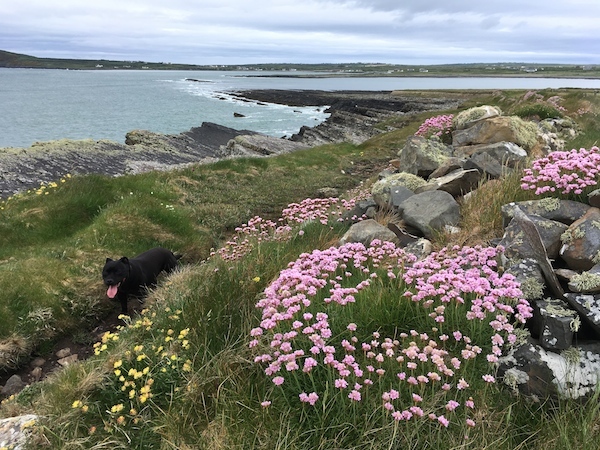 The Loop Head coast becomes covered in early wildflowers, such as Sea Pink or Thrift and Sea Campion which are seen in full bloom on the cliffs, walls and ditches. 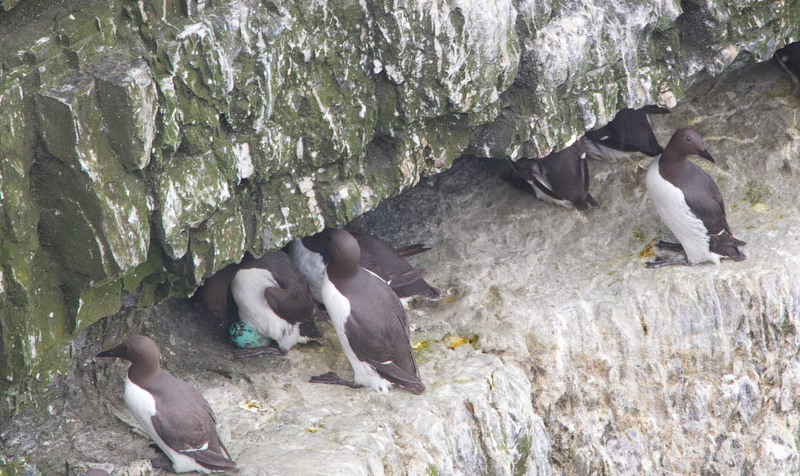 Nesting seabirds return to their cliff face breeding grounds. Thousands of pairs of Guillemots return to their breeding ledges at Loop Head and the sounds and smells are something to experience! Fulmars, Guillemots, Razorbills, Kittiwakes, Shags and Cormorants are all in nesting mode on the cliffs. Gulls prefer sea stacks for their nesting sites away from predation by rodents. The wild (or feral) goats of Rehy Hill, to the west of Carrigaholt, may be seen from our boat throughout the season as they graze the steep slopes. Mackerel arrive in sporadic shoals and new born dolphin calves are seen more frequently. We occasionally see Minke whales and Skuas. Peregrine chicks can be seen on cliff ledges near the nest site. The razorbills, an early breeder, leave their ledges by the third week of June, as their chicks have fledged. Shag and cormorant chicks are on their nests. Salmon are prevalent heading towards their river tributaries to lay their eggs. They are also the favourite fish repast for the Bottlenose Dolphin. 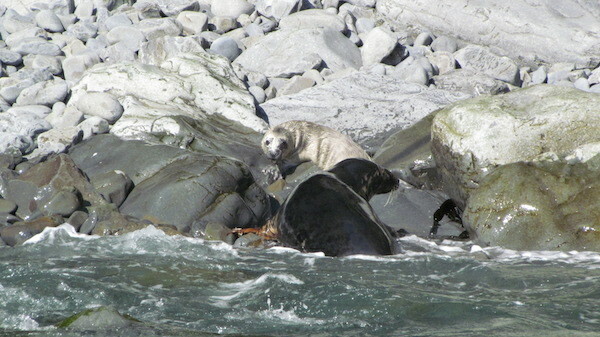 Grey seals can be seen basking at low tide on offshore rocks. 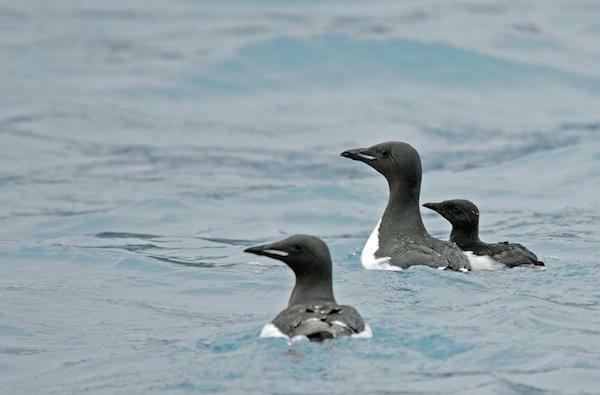 Guillemot chicks are leaving their cliff top nest areas and can be seen paired with their fathers, who teach them how to catch fish. Young gull chicks have hatched. Sunfish (Mola mola) are occasionally seen basking on the surface of the water, usually with one fin moving in the air as if waving! 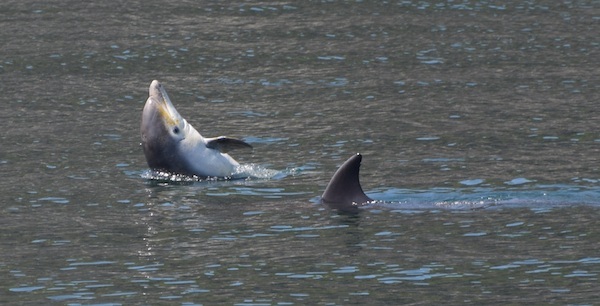 This is peak time for calving of Bottlenose Dolphins. 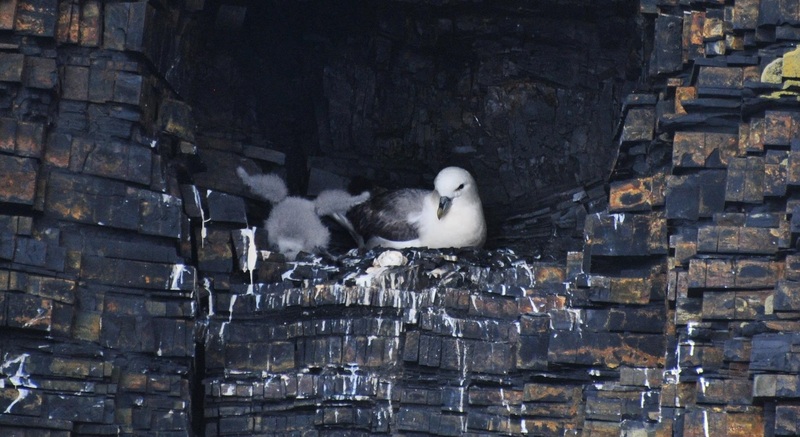 Fulmar chicks are visible on the ledges, white balls of fluff slowly developing and fledging at the end of August. Fulmar chicks can be seen in their cubby hole nests. Dolphins are west and south of Kilcredaun Point at the Mouth of the Shannon feeding on mackerel. In late August, female Grey Seals haul out onto storm beaches to give birth and suckle their young. Herrings have returned and dolphins need to dive deep for this important winter staple. Grey seals and their white coated pups can be seen on storm beaches. The bull seal can also be seen hanging around waiting for the mother to wean her pup so that he can breed with her. Seal pups are fed their mothers’ super rich milk for only three weeks, then they are on their own to fend and feed for themselves. Choughs, the rarest member of the crow family, can be seen along the Loop Head Coast with their distinctive red legs and beak and “cat’s cry” call. Traditionally, this month is good for whale spotting. The past few years, we have been seeing mainly Minke Whales throughout the Summer months in the outer estuary. Loop Head is one of the best coastal spotting areas for whales and dolphins in Ireland. The sun is lower in the sky and there is an autumnal chill, but wrap up warm and enjoy bow riding juvenile dolphins, diving gannets and the incredible scenery at the Mouth of the Shannon. Great flocks of Lapwing start to arrive. The wildlife at the Mouth of the Shannon in Co.Clare is affected by strong oceanic tidal currents, nourished by the nutrients washed by the rain from the land to the sea, and the changes that occur during the different seasonal weather patterns. Pelagic (deep water) fish such as herrings, sprat and mackerel are drawn into the estuary by the strong tidal currents and the bountiful supply of plankton, providing an oil rich diet for dolphins, seals and birds. Spring Tides, when the moon is full or when there is a new moon, occur every two weeks and the tides are stronger during this period. Dolphin activity becomes more predictable, as they hunt for fish along sand banks and tide rips. During the Neap Tides (between Springs), dolphins and other feeders need to roam a bit more looking for the fish. They are also able to rest more, as swimming against strong tidal currents during Spring Tides requires a lot of energy.